After a wind blown visit to Castlewood Canyon State Park we take sanctuary at the first church built in Castle Rock. 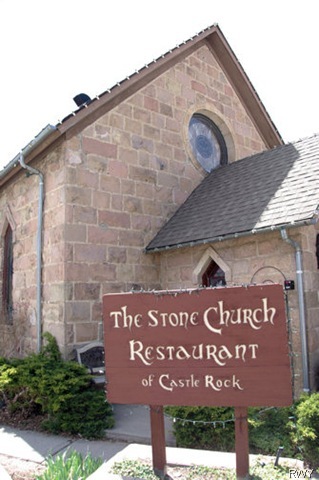 Today the Old Stone Church serves cuisine instead of a congregation. Where the confessional once stood a table for two awaits diners as does the choir loft. We always enjoy the creative dishes from chef/owner Jeff Richard. Trained at The Culinary Institute of America, Richard features fresh ingredients with a sense of adventure. I like the southwest influences and order the shrimp enchiladas with goat cheese and chipotle cream. A half-dozen grilled shrimp fill each enchilada. Packed with flavor, I soak up every drop of the chipotle cream with tortillas and the Mexican rice. Bob chose the Old Stone Church because he was lusting after their salmon. 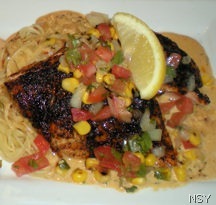 Java salmon is rubbed with coffee, ancho chile powder and brown sugar, served over a goat cheese pasta and topped with a corn relish. Sighs of contentment come from his side of the table. While we waited for the entrees we dipped warm pita pieces in a thick sauce of herbs, red pepper, red wine vinegar and olive oil. 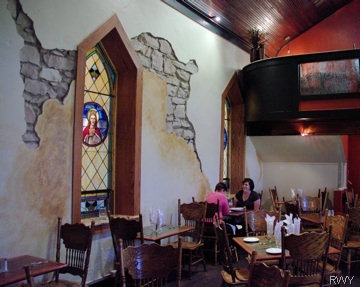 Although we didn’t have any on this visit every soup I’ve ever tried at The Old Stone Church has been perfect. I especially remember the cream of asparagus on our last visit. I believe Chef Richard shines when it comes to soups and sauces. Locals consider the Chaplain’s Bar, next to the dining room, their secret. From 3-6pm they relax with $5 appetizers and drink specials. The only complaint I’ve ever held is that we’ve never had a host/hostess that seemed glad you’ve walked in the door. Once we start interacting with the wait staff we feel welcome and receive good service but the initial greeting could certainly be improved. 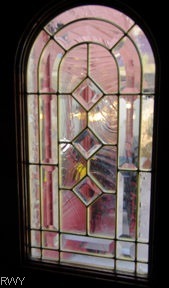 Flickering tea lights, a softly falling fountain, original stained glass windows and music creates a relaxed, a reprieve from a busy day, atmosphere. I feel I must confess we don’t come to the Old Stone Church frequently enough. The 18th annual Colorado Governor’s Art Show fills the galleries at Loveland Museum/Gallery through May 17, 2009. Featured are the works of 56 of Colorado’s finest painters and sculptors. The show is staged by the Thompson Valley Rotary and Loveland Rotary Clubs with proceeds used for Rotary projects in Larimer County. All works – watercolors, pastels, acrylics, oils, mixed media and sculpture – are for sale. Show director, Judy Archibald says, "The governor’s show offers an excellent opportunity for collectors to view works by some of the best and brightest artistic talents." Paintings by Kit Hevron Mahoney, Quang Ho, Michael Untiedt are annual favorites. A large number of sculptors make the Loveland area home. Locals George Lundeen, Rosetta, George Walbye and Fritz White are among the 15 represented in this year’s show. The show is open Tuesday – Friday 10am-5pm, Thursday evening until 9pm, Saturday 10am-4pm and Sunday noon – 4pm. No admission fee is charge; you can support the show by purchasing the full-color catalog, raffle tickets and, of course, the art. Donations gratefully accepted. The Loveland Museum/Gallery is located at Lincoln Avenue (Northbound US287) and 5th Street in downtown Loveland, Colorado. Nancy’s Notes: You’ll find sculpture in publics places throughout the Loveland community – "Mighty Casey" by Mark Lundeen at the Barnes Softball Complex, in front of businesses and firehouses, in parks and the civic center. A trip to Loveland should include a search for sculpture. Benson Park Sculpture Garden at 29th and Beech Drive exhibits the highest concentration with over 100 permanent installations. Studios, galleries and foundries further the visitor’s art experience. My favorite lunch site in Loveland is Schmidt’s Bakery & Deli at 808 14th SW. Don’t leave without something from the bakery – a sweet treat. This was our first visit at a Staybridge Suites, designed primarily for extended stays. Although we stayed only one night at the Las Cruces Staybridge I see thoughtful details that would be fully appreciated during a longer stay. For instance, the clothes basket in the closet great for collecting dirty clothes as well as trips back and forth to the laundry room. The laundry room is larger, better equipped and brighter than the typical motel facility. Too often they are tucked under the stairs or in a closet-sized space, poorly ventilated and just a bit spooky. In Las Cruces the registration area is small but other common areas seemed well proportioned and maintained. The Great Room with gas fireplace, comfortable furniture and televisions opens to an appealing landscaped living area. We also find an outdoor pool, hot tub, putting green and grill. The well-equipped fitness center stays open 24-hours a day, there’s no excuse for neglecting the workout routine. The business center offers several computers, printer/scanners and plenty of work space. In case you have a bit of free time and didn’t bring anything to read there’s a small library, also a few games. Internet access in the business center and guest rooms is free and high-speed – and it worked! Special features at the Las Cruces Staybridge Suites are a Home Theater on the 2nd floor, Internet Cafe on the 3rd floor and a public/private meeting space on the 4thfloor. The Home Theater is furnished with recliners with drink holders, extra large digital HD screen, surround sound, DVD and Blue Ray players – and a popcorn machine. Although we reserved a one-bedroom suite we were given a two bedroom/two bath. Being able to set up the laptop in the extra bedroom and work early in the morning while Bob still slept was an nice bonus. Quality bedding and linens contributed to a much needed night’s rest. The equipped kitchen included a stove top, microwave oven, full refrigerator and dishwasher. My only negative comment is that there is no ice machine in the hotel. They expect you to use the ice maker in your frig; however, if it’s not turned on when you check in it can’t keep up with demand – even for two people. The morning breakfast buffet served a number of hot items and more selections than we’re used to at Holiday Inn Expresses. I immediately noted the fact that we were eating on pottery dishes with real silverware – a welcome up-grade. The layout of the buffet and separate drink corridor was also appreciated. Tuesday, Wednesday and Thursday evenings the hotel hosts Evening Sundowner Receptions with food, drinks and a chance to socialize from 5:30 – 7:30pm. We’ve stayed in hotels, motels, historic inn and B&B in Las Cruces. By far the Staybridge Suites gets my vote for the place to return to. Next time we’ll plan more than one night. When You Go: The Staybridge Suites – Las Cruses is located near I-25 exit 6 at 2651 Northrise Drive on the north side of Las Cruces. A few days short of five months “Where To Go – Travel USA” had its 5,000th visitor today. To all those who have taken a look I send my thanks. Whether you’re family or friends, found the blog searching for a particular location or completely by accident I appreciate your visit. When I started this blog I had no idea what to expect. I wasn’t even sure I would stick with it five months. Each visit and every comment have inspired and encouraged my efforts. Thanks – please come again.